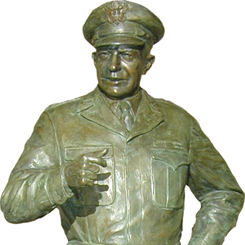 Bronze by Jim Brothers. 2003. Courtesy of the Architect of the Capitol, Statuary Hall Collection Dwight D. Eisenhower was the only President to speak before a Joint Meeting/Joint Sessions and Meetings as both a General and a President. The House approved 409 to 3 a resolution requested by President Dwight D. Eisenhower to authorize the president to defend Formosa (Taiwan) and the Pescadores Islands “as he deems necessary.” Passage of the resolution was precipitated in the fall of 1954 when Chinese Communist forces shelled Nationalist Chinese garrisons on the small islands of Quemoy and Matsu off the Chinese coast. The Senate approved the measure three days after the House, and it became law on the 29th of January. The Formosa Resolution revived the practice, dating to the 1790s, whereby Congress occassionally granted presidents pre-authorization to use American forces abroad.